You can configure Echo devices with the Zoom for Alexa skill, and then deploy them into new or existing Zoom Rooms across your organization. After the devices are configured, participants in Zoom Rooms can start, join, and end Zoom meetings by speaking to Alexa. AWS Tools for Windows PowerShell. NET Framework 3.5 or later. See the Managing Devices section of the Alexa for Business Administration Guide for a information about supported devices. Perform each of the following high-level steps for the first Echo device that you want to configure for Zoom Rooms. If you configure multiple devices, you need to repeat Steps 1, 5, 6, 8, and 9 for each device. You only need to perform Steps 2, 3, 4, and 7 once, regardless of how many devices you configure. If your test for Alexa voice commands is not successful, check the known issues and troubleshooting information for additional information. 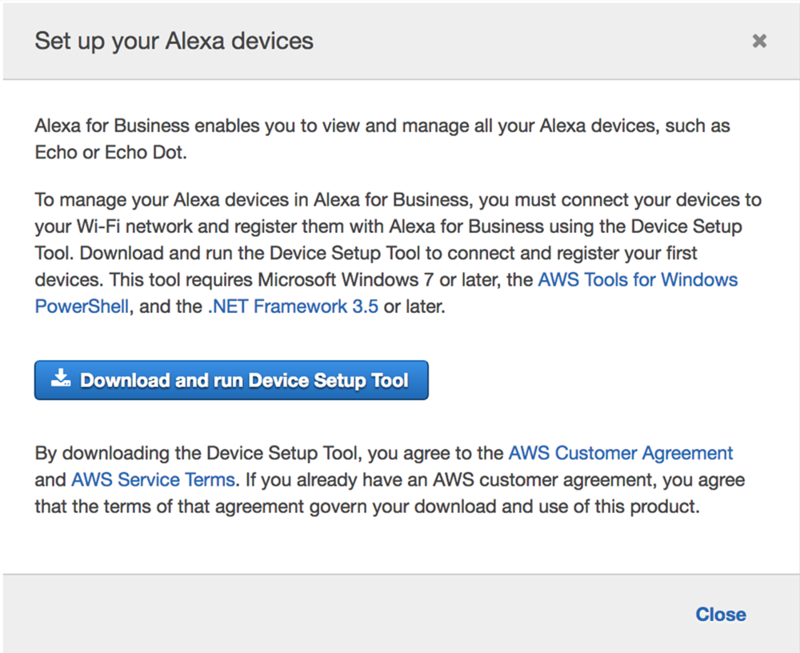 Note: Instructions are available in the Getting Started with Shared Devices section of the Alexa for Business Administration Guide. Make sure your Windows PC is connected to the same wifi network as your Echo device. Follow the instructions in the Create an IAM User for Device Setup Tool section of the Alexa for Business Administration Guide. Sign into your A4B web console with the credentials for the master account. Navigate to the Shared devices page of the A4B web console. Click the Set up devices button, then click the Download and run Device Setup Tool button in the dialog. Note that this tool is only available on Windows version 7 or later. Click the setup.exe file to begin the installation of the Device Setup Tool. Follow the voice instructions from your Echo device to complete the setup. Note: If your Echo device is not in setup mode, hold down the Action button (the button with the dot) for at least 8 seconds to enter setup mode. After the setup is complete, your device is shown on the Shared devices page on the A4B web portal, with the status of Synced. On the Amazon website, click the Alexa Skills tab to search for and select Zoom for Alexa. Sign into Amazon with the account configured as the master account, then click the Enable button to get this skill. Note that you must have pop-ups enabled on your browser. You are redirected to the Zoom website, where you must authorize the Echo device to use your Zoom account. Go to the Enabled skills tab on the Skills page of your A4B console to verify that the Zoom for Alexa skill shows a status of Account linked. Note: Instructions are available in the Managing Skill Groups section of the Alexa for Business Administration Guide. On the A4B web portal, navigate to the Skill groups page. Click the Create skill group button. The Create skill group dialog displays. Enter unique values for the Name and Description, then click Create. The Skill group is added to the list of Skill groups. Click the name of the group you added, then click the Add skills button. Select the Zoom for Alexa skill, then click the Add button. Note: Instructions are available in the Managing Conferencing Providers section of the Alexa for Business Administration Guide. On the A4B web console, navigate to the Conferencing page. Click the Add provider button. Select Zoom as your conferencing provider, then click Add. Enable the Zoom for Alexa skill for your video conferencing equipment. Note: Instructions are available in the Managing Rooms section of the Alexa for Business Administration Guide. On the A4B web console, navigate to Rooms > Create room. Enter a unique name for the room in the Room field. (Optional) To add a device, select the check box next to the device. Click the name of the room you created in Step 5: Create a room in Alexa for Business. Click the pencil icon to edit the skill configuration. This is the name of a Zoom room that either already exists or that you will create in the Zoom web portal. Important: You must only use the names of Zoom rooms that are created under the master account, as described in Step 8: Set up a Zoom room. On the Rooms page of the A4B web console, click the name of the room you created. Verify that the status is Synced in the Alexa Devices section of the page. Verify that the Skill status, Master account linked and with scope value. Scroll to the Smart home devices section of the page. Click the Discover devices button. Verify that you see the Echo device listed under Smart home devices. This confirms that A4B has found the skill adapter that you configured. Sign into the Zoom web portal with the credentials for the master account that you used to link the Zoom for Alexa skill in A4B. Create or identify a separate Zoom room for each Echo device. See Add Zoom Rooms for instructions. Important: The name of the Zoom room must be the same as the scope value of Zoom for Alexa in A4B, which was done in Step 6: Edit Room Skill Configuration. (Optional) Associate a Google calendar to each Zoom room you create. You are now ready to test your Echo device to ensure that you can start, join, and end meetings using voice commands. On your Mac or Windows PC, sign into your Zoom room with the credentials for the master account. Choose the Zoom room name that you configured for Alexa. Plug in or restart your Echo device. The Alexa software on the Echo device is ready to implement Zoom Rooms commands. Alexa voice commands are conversational. The end user does not have to follow the command syntax. The following examples show how users can start, join, or end a meeting. 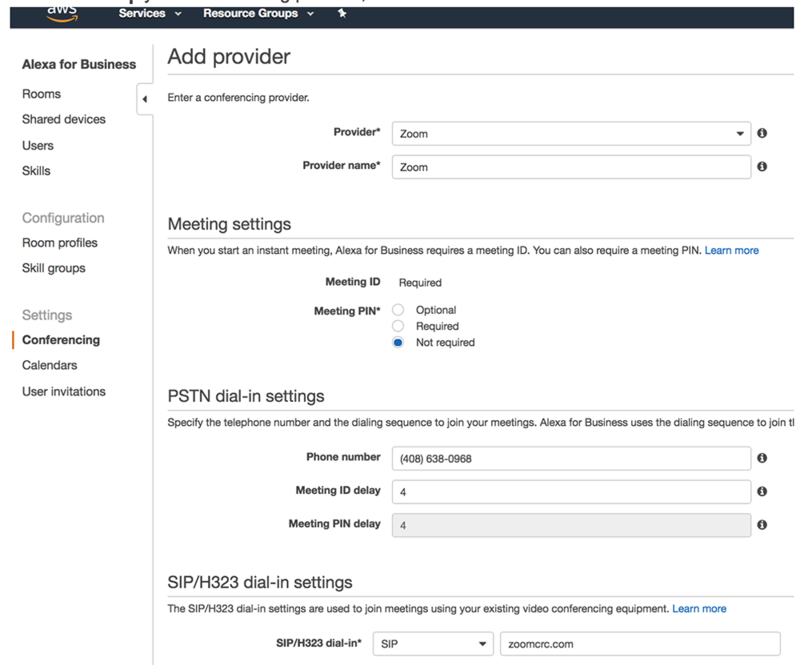 Note: Using 123 as the meeting ID is a workaround developed by Zoom because A4B does not support the instant meetings. The instant meeting begins in the Zoom room. Zoom locates the next upcoming meeting on the Google calendar that is associated with the Zoom room. Zoom has access to information about the meeting organizer, meeting topic, and meeting number. If an upcoming meeting is available on the room calendar, Alexa asks "Do you want to join meeting organized by <organizer displayName/email>?" If the user says “Yes”, Alexa says “Okay,” and that meeting is started in the Zoom room. If the user says “No”, Alexa will ask “What is your Zoom meeting id?" The user responds with the meeting number. If the meeting ID is valid, Alexa will say “Okay” and start or join that meeting in the Zoom room. The user says something similar to “Alexa, end meeting”. Alexa will say “Okay” and the meeting ends. The Zoom for Alexa skill does not support meetings that use a pin or password. If a scheduled meeting is in progress, but had already started before the user asks Alexa to start or join the meeting, Alexa will not be able to locate that meeting on the Google calendar for the Zoom room. Resolution: Make sure the account used for account linking is the same as the account that you used to sign into your Zoom room. Issue 2: Alexa cannot find an upcoming event that is on your calendar. Resolution: Make sure that the meeting on your calendar was scheduled as a Zoom meeting. Resolution: Make sure you have the latest version of the Zoom Rooms software.